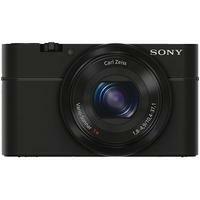 The Sony Cyber-shot RX100 Digital Camera is an advanced, pocket-sized camera that features a 1.0"-type Exmor CMOS sensor with a resolution of 20.2 effective megapixels and an ultra-bright f1.8 Carl Zeiss lens, to ensure outstanding picture quality throughout its 3.6x optical zoom. In combination with this technology, the Sony RX100 is also equipped with an integrated flash and a high ISO of up to 25600 (using Multi Frame Noise Reduction) enabling you to capture great handheld images in dimly lit situations. As well as taking sharp stills, the RX100 can also shoot clear Full HD 1080p videos with full manual control. The unique Control Ring surrounding the lens body ensures smooth, fingertip adjustment of exposure, zoom, Picture Effect and more. Other features of the RX100 include a 3.0 Xtra Fine LCD (1229k dot), continuous shooting of up to 10fps, a Function (fn) button, Picture Effects, and both Auto & Manual controls.